Does Amazon even make money when Fire 7 tablets are on sale for $35, like it is right now? 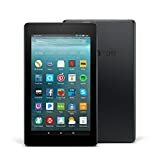 At just $50, we’ve often wondered what kind of margin Amazon could possibly make on the Fire 7 Tablet. It’s an excellent compact tablet that gives users easy access to all of Amazon’s services, so perhaps the company just tries to break even on the hardware. If you’re a Prime subscriber though, you can buy a Fire 7 Tablet today for just $34.99. Amazon has to be losing money at that price, right! ?